Starting around 1887, using his wife and son as models, Cézanne began to paint single figures with the same gravity he had developed in his landscapes and still lifes. Around 1890 he extended his options by enlisting workers from his family’s estate in the south of France. The worker who posed for Man in a Blue Smock also posed for the famous Cardplayers compositions of the early 1890s. For the remainder of his career, Cézanne maintained his interest in making portraits of rural workers—if the term “portrait” can be applied to images of anonymous models posed as themselves in the studio. 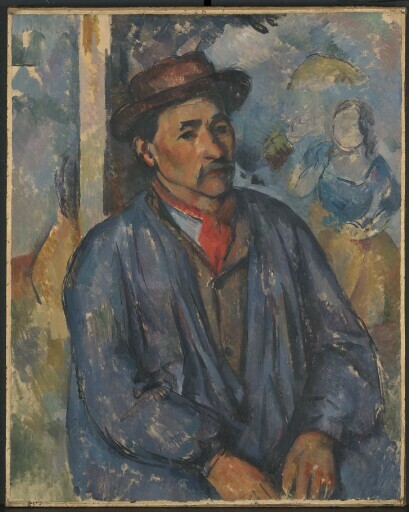 In the background of Man in a Blue Smock, Cézanne represented the right-hand section of a folding screen that was his very first work of art (around 1859, Musée Granet, Aix-en-Provence). Featuring elegant figures such as the woman with a parasol, this was a scene of leisure rendered in the pastoral spirit of an eighteenth-century tapestry. Juxtaposed in an ambiguous way next to the worker in the Kimbell portrait, this faceless woman perhaps suggests some mute dialogue between opposite sexes, differing social classes, or even between the artist’s earliest and most fully evolved efforts as a painter. Not counting his classical nudes in landscape settings, Cézanne had mostly abandoned figure painting after his portrait of the painter Achille Emperaire (Musée d’Orsay, Paris) was refused by the jury of the Salon of 1870. Left on deposit at the shop of the art-supply dealer Julien Tanguy, the Emperaire portrait was a revelation around 1887 to young Post-Impressionist painters including Vincent van Gogh. The enthusiasm of these younger artists may have helped rekindle Cézanne’s lapsed interest in portraiture. Kimbell Art Museum, Acoustiguide Inc.
purchased by Kimbell Art Foundation, Fort Worth, 1980.